MSR recently made this product much better by adding the 8 foot poles to their inventory. By adding these poles to the wing you have a virtual palace of a work area to cover a picnic table or camp kitchen. 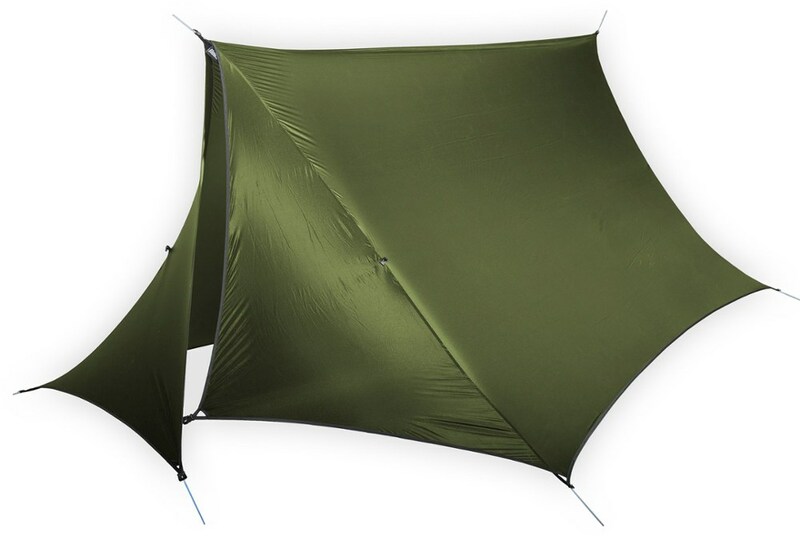 I use the 12" type stakes that Cabela's sells for its outfitter series tents and it makes for a very solid shelter. 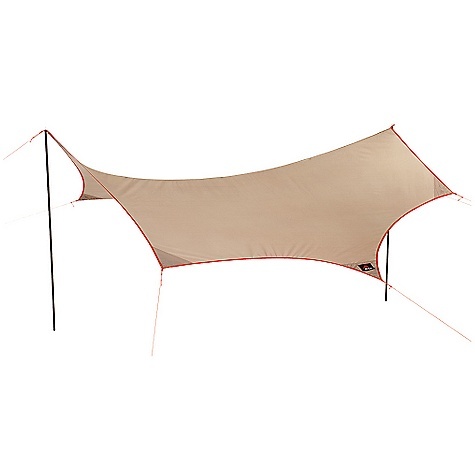 It is great for group outtings for shade and rain protection. Very tough and large area of coverage. With the poles there is more than adequate height. I have used this car camping several times and it works very well. The other uses also apply. It is definitely either a base camp or rafting application. Again with the addition of the additional poles or kayak paddles it makes it very user friendly. Enhanced stakes will also make it hold better in the wind. Our Boy Scout Troop has one of these and it is great. Our Boy Scout Troop has one of these and it is great. It does not make any noise when the wind is blowing. 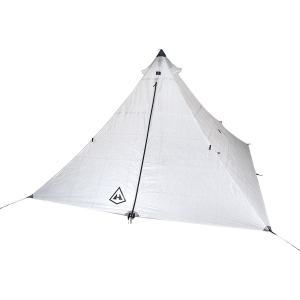 We had some rough weather one night, the wind was blowing my 3 man Kelty tent to within a few inches of my nose. The next morning, this MSR Wing was still up, in place with only one stake loose! If you are over 6 ft tall you will need to rig it so that the middle does not rub your head. 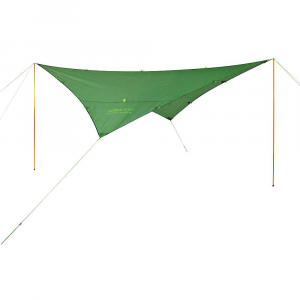 This is a great tarp for car camping, going to the park or for your patio. I bought it for car camping in the Rockies. It also sets up perfect from my back door over our picnic table. It is up right now. It is raining now and it we even just got some light hail. No problem. You can use trekking poles on any of the side guy points. I even have a trekking pole in the center from the picnic table. 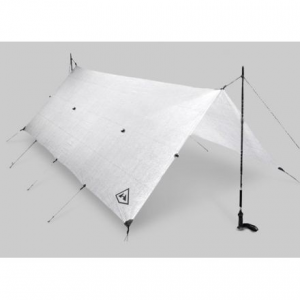 This tarp comes with everything you need too, unlike some products were you don't have enough stakes. The stakes are large plastic and have a nice groove for the guy line to run through so it will not slip off. Very nice tarp. It is heavy though so I cannot imagine anyone packing this unless they split all the parts between a handful of people. Well designed and well made, thats how I'd describe it. I really like the velcro pockets that stow away each guyline. They keep them from getting tangled which is great when setting up in a rain. The "rock buster" stakes are beefy and hold in high winds and all stress points are bar tacked. I work with juvenile delinquents and take them backpacking and have had 14 people under it. I'm 6'3" and can stand under it. It is heavy but the name ought to give that away. 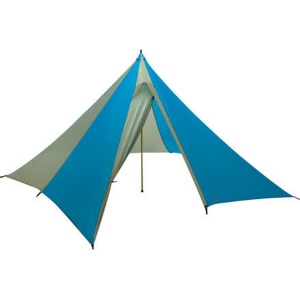 Lots of setup configurations are possible and it works great as a front porch for a tent. It's also worked great on gravel/sand bars as a sun shade. I've been around several other tarps and none compare. The OutfitterWing has been discontinued. The MSR OutfitterWing is not available from the stores we monitor. It was last seen January 15, 2013	at Mountain Gear.